Grass-fed whey protein? Stevia? Safe for children to consume? Is there a whey protein supplement which has all of these qualities? Hard to fathom such a scenario in this day and age. SFH Pure Whey Protein has the makings of an outstanding protein supplement, as this review will attest. Grass-fed whey protein. A well fed cow means more amino acids and nutrients than traditional whey. 23 g protein per scoop. Not bad, but not the best either. RECOMMENDED DOSE: As a dietary supplement, add 6 to 8 oz. of water or your favorite beverage. To avoid clumps, do not add ice. Store in a cool, dry place. Do not refrigerate. Inasmuch as the Olympics are a world-class event, SFH Pure Whey Protein is also striving to become a major player in the bodybuilding supplement industry. It’s pretty easy to see why it’s getting there. 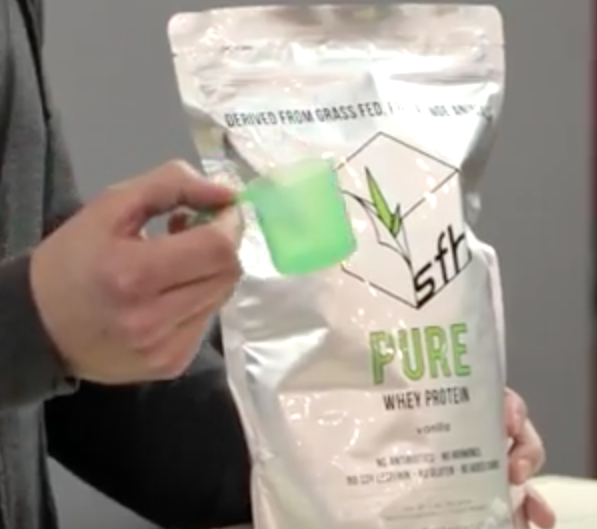 First off, SFH Pure Whey keeps things simple. How simple? The manufacturer uses just whey protein concentrate. 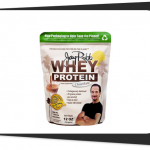 In this day and age, most of the renowned supplement brands rely on a combination of whey protein concentrate and whey protein isolates for better results. 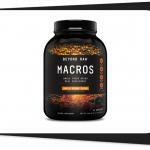 Meet one of the simplest and cleanest protein powder supplements on the market. Other companies even add whey protein hyrolysates, egg albumin, and casein protein to their protein blends for a better anabolic effect. Not so with SFH Pure grass fed Whey Protein. The name “Pure Whey” says it all. With an exclusive whey protein concentrate (WPC) protein content (23 grams per serving), this product can get the job done. WPC has an estimated 30-80 percent protein content and 5-7 percent lactose content (SFH Pure Whey Protein has 82 percent whey protein content. Pretty good.). It is rich in branch-chained amino acids (BCAAs), rapidly absorbed (within 30 minutes of consumption), and has good solubility. Another key feature of WPC is it undergoes less processing than its WPI counterpart. Thus, some fitness experts argue the former has more health benefits. Among these are WPC’s abilities to boost the immune system, increase muscle mass, and produce conjugated linoleic acid (CLA) which helps ward off cancer. As if these weren’t enough, WPC also helps produce butyric acid, an essential fatty acid which serves as an energy source for the colon. One of the few downsides of WPC is the possibility it contains impurities, which may trigger bloating and gas. On that note, it’s hard to imagine SFH Pure Whey Protein containing any impurities for two reasons. First, SFH Pure Whey Protein has made it to the top protein lists of several big-name websites. It wouldn’t have made it that far had it had any questionable ingredients. Second, the short ingredient list suggests there are no fillers and proprietary blends in the product. If you spot a supplement with too many unfamiliar components in the “Other Ingredients” section, watch out (for a comprehensive guide on how to purchase supplements, check this out). The manufacturer says even children can benefit from SFH Pure Whey Protein. Most of today’s whey protein supplements are suitable for individuals who are at least 18 years of age. Perhaps the most impressive quality of SFH Pure Whey Protein is that it is grass fed. Far too many protein supplement manufacturers feed their cows with growth hormones and other questionable ingredients. SFH doesn’t cut corners, folks. Any time you spot a grass-fed whey protein sweetened with stevia on the store shelf, grab it. Savor it. Better believe it: Studies have proven grass-fed whey protein has more amino acids and nutrients than regular whey. Total fat, 1 g: We’re amazed at how the manufacturer was able to minimize SFH Pure Whey Protein’s total fat content to just one gram per serving. Think about it: You’d normally see this much fat in a whey protein isolate product. A whey protein concentrate product – which usually has a higher fat content than WPI – replicating that feat is nothing short of amazing. Total Carbohydrate, 3 g: You’d expect this much carbohydrates for a whey protein concentrate supplement. We attribute SFH Pure Whey Protein’s carb content to the natural chocolate flavor and stevia, a natural sweetener which can help regulate blood sugar and blood pressure levels. Supplements with stevia are few and far between. Do yourself a favor and include them in your shortlist. Cholesterol, 25 mg: Pretty low cholesterol levels, if you ask us (not as low as other top-notch protein supplements such as MyProtein Impact Whey Protein, however). Those who are cholesterol-conscious need not worry. Calcium, 110 mg: SFH Pure Whey Protein is a decent source of calcium, as it has 10 percent the recommended daily value. It’s a good compliment to your daily glass of milk. Better yet, try adding it to milk for a more powerful calcium punch. Sodium, 40 mg: While sodium is important in the muscle recovery process, too much of it may be detrimental to those with cardiovascular concerns. With only 40 milligrams of sodium per serving, SFH Pure Whey Protein is a safe bet for everyone. Potassium, 135 mg: A key mineral which helps regulate blood pressure levels. SFH Pure Whey Protein’s potassium levels are not extremely high, but may be of some concern to people who have heart issues. It’s always best to seek your doctor’s advice. SFH Pure Whey Protein has 23 grams of whey protein concentrate per serving. Like we already said, whey protein concentrate (WPC) helps increase muscle mass, boost the immune system, and ward off cancer. We’re confident you’ll reap all of these benefits with this supplement. Some skeptics downplay WPC because of impurities which may have eluded the filtration process. No need to worry. SFH Pure Whey Protein has earned a stellar reputation in the fitness industry (based on several websites). What’s more is the simplicity of the ingredients list suggests the absence of nasty fillers and proprietary blends. Awesome. The other ingredients of SFH Pure Whey Protein are all within reasonable limits (with the possible exception of potassium). 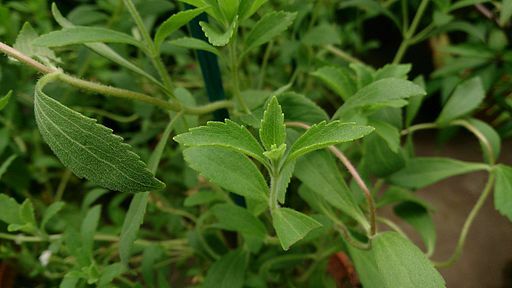 We also like the fact the manufacturer uses stevia, one of the few sweeteners we’d recommend in a heartbeat. 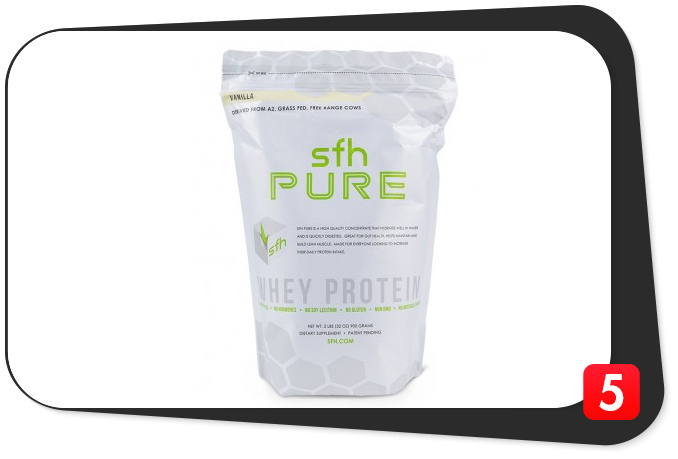 Plus, SFH Pure Whey Protein features grass-fed cow’s milk, which has more amino acids and nutrients than regular whey. How many manufacturers can proudly say that? Taking all of these into consideration, we believe SFH Pure Whey Protein’s simple formula ought to win many consumers’ loyalty the world over. However, be prepared to shell out good money for it: One two-lb. container costs $49.99. Other 5-lb. protein supplements cost that much. It should be money well spent. According to SFH’s official website, this product “is a rich source of the essential amino acids needed on a daily basis by the body.” The company adds SFH Pure Whey Protein is low in cholesterol and lactose and high in calcium. We agree on all fronts. SFH Pure Whey Protein not only will help you build muscle mass, it also will give you other health benefits as well. Not too many whey protein supplement manufacturers are bold enough to say their product can benefit children. SFH is an exception to the norm. Well, the manufacturer already said it: SFH Pure Whey Protein is a great protein supplement for people of all ages. A typical protein supplement is best suited for athletes and active individuals who want to pack on lean muscle mass and boost recovery. It seems to us SFH Pure Whey Protein can do those things and boost general health as well. It’s one of the most versatile supplements we’ve ever come across. SFH Pure Whey Protein seems to have no glaring side effects. Even if the product is a whey protein concentrate supplement, the manufacturer says the lactose content is low. Good news all around for individuals who are lactose intolerant. If the potassium content (135 mg per serving) is a tad big high for your liking, best to consult with your physician before consuming. Pure whey protein concentrate content. Twenty-three grams of WPC per serving. Low in cholesterol, sodium, and lactose. A plus for many consumers. Grass-fed whey protein. Fuel up with more amino acids and nutrients than regular whey. Sweetened with stevia. Natural sweetener which helps regular blood sugar and blood pressure. Relatively high potassium content. One hundred thirty-five milligrams per serving. Expensive. $49.99 for a 2-lb. container. SFH Pure Whey Protein is one of the most versatile supplements in the market: It can help build muscle, boost the immune system, and ward off cancer and the like. Plus, individuals young and old can enjoy it as an addition to their favorite snacks for good general health. 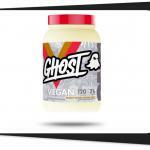 The product has a lot of things going for it: Twenty-three grams of WPC per serving, grass-fed whey protein component, and stevia, to name a few. Long story short, it’s a high-quality protein supplement which ought to give you fantastic results. Having said that, it doesn’t come cheap. Smart consumers know you pay for quality. With SFH Pure Whey Protein, you pay more, but you also receive more.